Eurocom, (www.eurocom.com) is shipping the Panther 5SE Mobile Server that is ready to go (R2GO), right out of the box, loaded with Microsoft Server 2012. The EUROCOM Panther 5 Server Edition with Microsoft Windows Server 2012 provides extra virtualization capability, allowing higher performance, low cost computing through virtualization on one platform. A Mobile Server is a computer system that has full server capability while being easily portable in a laptop form factor. Eurocom launched its first Intel Xeon powered Mobile Server in 2007, named the Phantom-X. Since its introduction Eurocom has been building on the capabilities and improving on the Mobile Server concept with every new version. The most advanced version yet, the Panther 5SE is the most stable, capable, scalable and durable Mobile Server solution to date. “Mobile Servers allow users to expand into new geographic market, gain new customers and secure new projects” Mark Bialic, Eurocom President. If a unit needs to be swapped out for any reason, simply grab and go. Most of the wiring required in rack mount scenarios vanishes with the Mobile Server. Obviously, taking a racked server to a customer’s site is problematic, and even tower-style servers are considerably more cumbersome. A Panther 5SE solution simply slips into a notebook carrying case. A racked system still requires a keyboard, mouse, and monitor, which are often placed on additional trays within the rack in order to minimize the total hardware footprint. With Mobile Servres, these peripherals are integrated. Conventional servers require attendant UPS capability rated for at least 10 to 15 minutes of runtime before shutdown. With the Panther 5SE, the swappable polymer Li-Ion battery provides many times this amount. The idea of a portable server is appealing to application developers, emergency responders, on-site trainers and others who need powerful computing solutions wherever they may be. 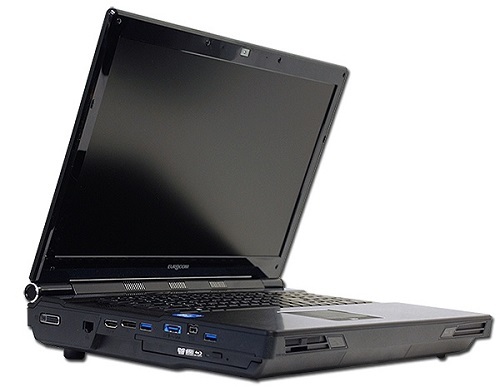 The EUROCOM Panther 5 Server Edition is a heavy duty Intel Xeon based super-computer class laptop designed for Server On-the-Go deployment. It is powered by Intel's family of Xeon E5-2600 series 6 and 8 cores processors, capable to deliver server class performance in a small and compact 12lbs/5.5kg, All-in-One package complete with integrated keyboard, 17.3” LCD Display and built-in UPS (Uninterruptible Power Supply). The Panther 5SE is easy to transport, move around and relocate as it can fit into a single carrying bag because of its all in one, compact design. The EUROCOM Panther 5SE is driven by a complete line of optional 4 core, 8 thread, 6 core, 12 thread and 8 core, 16 thread Intel Xeon E5 Processors, based on the LGA 2011 processor socket. The top of the line Intel Xeon E5-2690 has 8 cores, 16 threads, 20 MB of L3 cache, running at 2.9 GHz, supports Intel vPro Technology, Intel Virtualization Technology, Intel Hyper-Threading Technology and Intel Virtualization Technology for I/O. Eurocom Mobile Servers are designed to support large amounts of high capacity, redundant storage options for server class environments. Solid State, Hybrid, or Enterprise level drives with RAID capability are supported in the Panther 5SE. With support for up to four 1.5 terabyte storage drives, the Panther is able to offer 6 terabytes of storage. RAID 0,1,5,10 capability gives users the ultimate in performance or redundancy. The Panther 5SE comes with an Intel® 82579V Gigabit Ethernet port for greater compatibility with modern server operating systems such as Windows Server 2012. A second LAN adapter can also be added via the ExpressCard slot or a quad port LAN through the MagmaExpress Box. Additional LAN capability can be added through the ExpressCard slot itself, while also allowing connection to a MagamExpressBox for even greater LAN capability. Equipped with a built in uninterruptible power supply (UPS) in the form of a 78.44Wh lithium-ion swappable battery pack, which offers upwards of an hour or backup power in case of electricity failure. An external power supply creates a smaller, lighter chassis that requires less ambient cooling than traditional servers. The sixth release of Windows Server, Windows Server 2012 has added several features, such as an updated version of Hyper-V, an IP address management tool (IPAM), a new version of Windows Task Manager, Resilient File System (ReFS), Internet Information Services 8.0 and a redesigned and improve user interface in Task Manager.